I've been out of the sport for a little while; however, I'm getting back in and I'm looking for a few things. 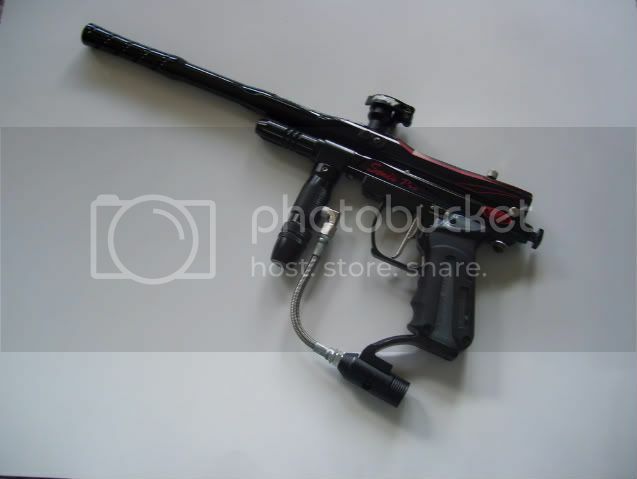 The first thing I need are some grips for my custom built 2k5'd Species Intimidator. About a year or two ago, there was someone making some custom grips on pbnation but I've had not luck. Any new grips out there (the colors would need to be black & blue) that would fit my need? Also looking for a 68/45 stubby tank and wandering where's the best place to look for tanks or is there anything new out worth looking into? Thanks guy and I appreciate any help with finishing my project. This is who you want to make your grips. Perfect Shu, that's exactly what I was looking for. After seeing those custom grips, I'm thinking of taking a picture similar to this and have a black to blue fade done to match "Sil." What do you think? or maybe this pic, keeping the same colors. I think I like the first one better. looks meaner. I really appreciate the help guys. I've been searching all days for custom grips like these and have had no luck. Here's an old pic of "Sil", I'm open to any other suggestions you may have for grips. Definately thinking the grips can make or break this marker. hmm, i think even all black would look good. you think just a single color black grip. No species image? i dont know about the exact image, but i think black grips with a little matching blue would look good. my Dark has those colors inverted, so i've been looking at black/blue grips too, but i cant find a design i like.